I completed this layout on Saturday night. I usually stay up on Friday and Saturday nights to get my scrapping done. I like the peace and I am left to scrap without interuptions of 'Mummy' requests from the kids...So I will be cutting, snipping, pasting, arranging while listening/ watching to the tv or youtube. This came from Pink Paislee's Butterfly Garden line. More butterflies and you thought I would have had enough after BoBunny's Gabrielle collection for my class! Lol. I cut out part of the top sheet of patterned paper, tore the vertical sides, rolled it over and distressed using some pink chalk ink. Lots of fussy cutting and layering of the elements to get this 'garden' look. The patterns on the paper really resemble the beautiful garden outside the cottage of a farm we visited in Australia. It was like a scene out of Enid Blyton's fairytale come alive, with colorful flowers growing everywhere, even on the walls of the cottage! Can't resist showing the close-ups of these cut-outs. I am feeling so satisfied after all that cutting! And that charm there, is simply darling! My Mind's Eye is another one of my favorite line. Their designs are so classy and timeless and they always come up with co-ordinating boy and girl lines. Honestly, if I had a huge scrap room and huge storage space, I will be hoarding every paper out there in the market! Lol! 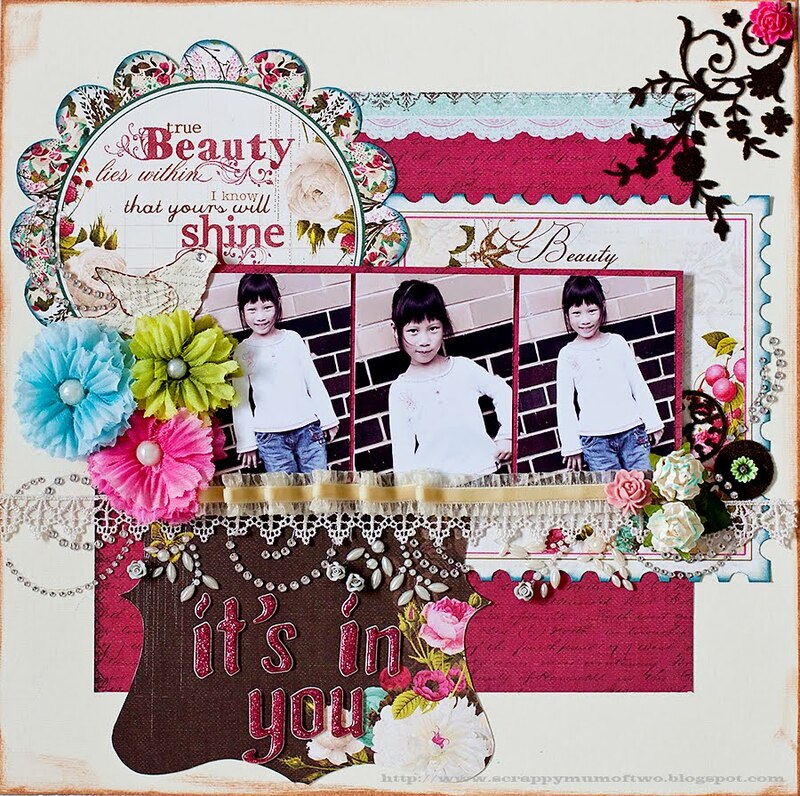 I used the new Stella & Rose- Hattie line for the following layout. 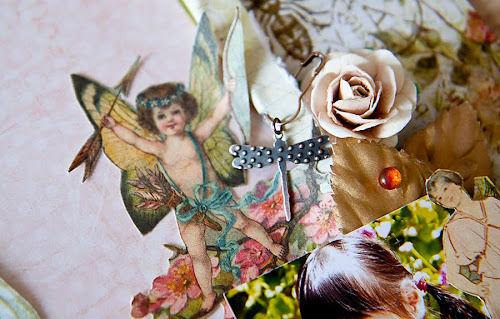 There are a total of 4 lines in the Stella & Rose collections, all so pretty and versatile for various themes! Anyhow, the colors in the Hattie line are definitely more boyish with its greens, blues and browns and I lapped up the collection so that I can create more layouts for Asher. I traced the shape of a bracket die-cut onto the pattern paper, cut it into two and layered the two layers over each other. I also distressed the edges of the paper with a paper distresser and inked it before folding the corner and attaching it down with a brad. I pleated a strip of the pattern paper to give the layout some dimension before adding the rest of the embellishments. Overall, the layout looks very simple but there are my signature details here and there. Thanks for looking and have a good weekend! Banner of the Week at Websters Pages! 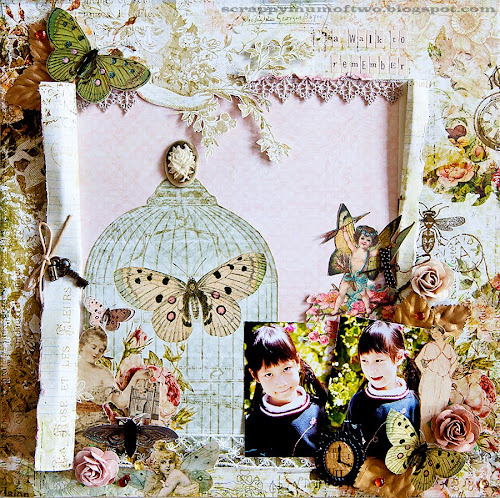 My layout has been chosen as Banner of the Week over at Websters Pages! 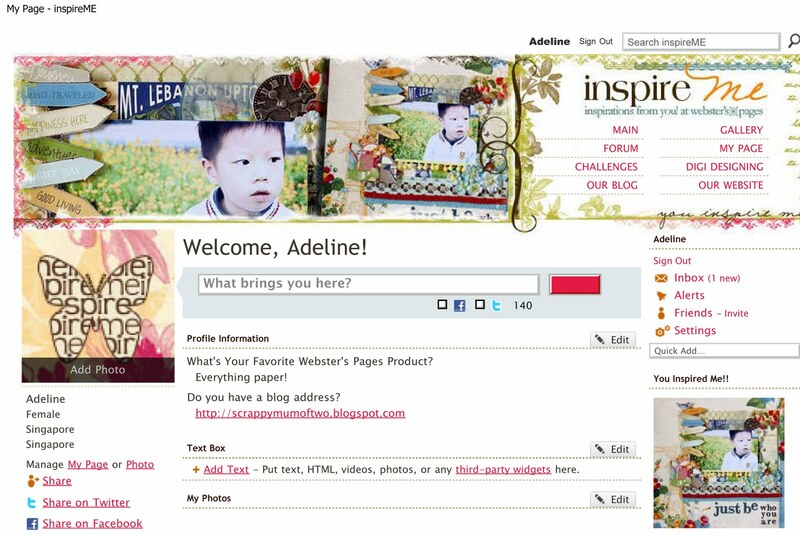 I am really flattered as Websters Pages is one of my favorite brands (which most of you may well know by now!) All these little bits of encouragement really do help to brighten the days, especially when it's gloomy and raining over at this end of Singapore! So may the showers and new blooms of spring chase away the gloom over Japan's tragedy. My heart and prayers go out to my favorite country. Wow!!! I was babysitting my little niece the entire evening, neglecting my own two little monkeys and was bushed out by the time the contented parents (who finally had some couple time on their own) came home. I walked back home (our apartments are only 2 blocks apart) to find an email in my inbox, telling me that I have been highlighted on Club CK blog! Wowz! Club CK has a huge forum and the talent there is plentiful. Lots on inspiration daily and yet my layout was highlighted in their post, along with several other very inspiring layouts. Thank you so much! This came as a timely encouragement especially when I am a person who constantly doubts if my layouts are beautiful enough to be shared. I have also met several people in the past week who have been so encouraging with their comments and I am blessed to know these new, yet very sincere friends through this hobby. My first class kicks off this Friday, am not so nervous yet but I am so sure I'll have a sleepless night before...hahaha...I am quite shy actually (though I talk a lot here) but definitely more than willing to share what I know, so for people attending my class, please feel free to ask me anything you may want to know. I may not have all the answers but hopefully I can inspire in one way or another! Last week was a productive week. By my standards, anything more than one layout is productive and I managed to squeeze out 2, had a very enjoyable week with Adah who is on a one-week school holiday break, taught the first two scrapbooking and altered art classes at Made With Love and scheduled in 2 photography shoots! One of the ladies who attended the class asked me how I usually start off on a layout. For me, I usually scrap about my kids. So, the moment captured on camera and the significance behind that photo is the most important thing that I want to remember and record on paper. I usually start off with the photo I want to scrap first, then pick the papers and then edit my photos to suit the papers. Sometimes, I go for a saturated look, sometimes a vintage look depending on my look and the feel of the papers. But for this series of Websters Pages which I wanted to scrap immediately once I lay my hands on it, I started going through my photos to find one that will suit the papers. 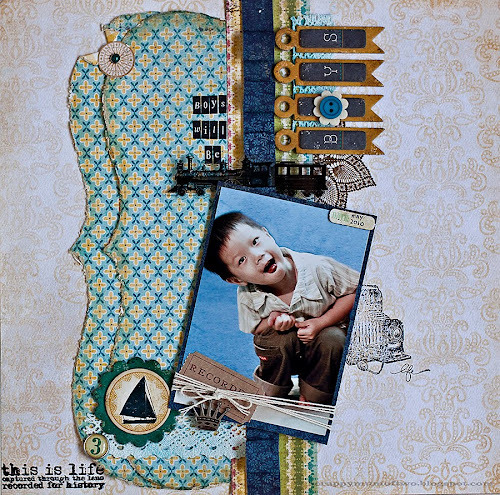 I usually scrap my girl's photos for Websters Pages as the papers are more floral, but the minute I saw this photo of my boy, I knew it would be a perfect match!Love the patch of little yellow flowers behind my boy in the photo! 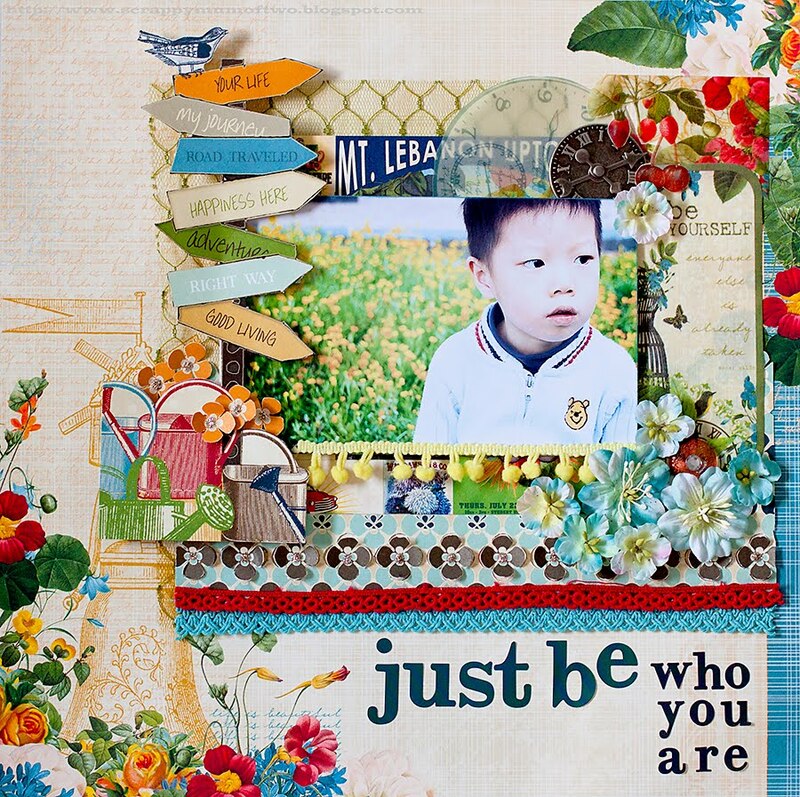 This is the Spring Market line and the details are not too floral or girly to be used for a boy's layout. I cut out the sign post from one of the papers, some of the flowers from the vellum and outlined the petals of the row of brown flowers with a cutter, and rolled them up for a 'pop- up' look.The fabric tag was from an older line from Websters too. It says 'be yourself', hence my title,' Just be who you are'. A close-up of the layout. I can't wait for Websters' new lines to arrive. Totally in love over the Ladies and Gents' line and the Countryside line too! The new florettes, the sparklers and the new yummy embellishments that they have came up with for this CHA are so, so, so beautiful. Can't wait to lay my hands on them, lol! I also want to say 'Thank You' to all the ladies who attended my class on Friday and Saturday. I am really very, very, very flattered and humbled by your comments. We had a lot of fun, cutting first and then 'modified' the samples to fit photos, to cover up mistakes or to suit personal tastes. I had a great time meeting everyone in class! I did not expect such a good response, given that it was my first class. 2 ladies flew in from Indonesia to attend and there was another who waited very early outside the store before it opened, hoping for a dropout from the fully-booked class so that she could attend. Once again, thank you for attending my class and I hope to see you ladies again soon! I created this LO to participate in Prima's March BAP. I am now a fan of their monthly BAP. Their sketches are really fun and versatile and the Prima's design team really work wonders every month. I love quotes. I think most of them are so wise and timely reminders in our daily lives. 'True beauty lies within'- a reminder that I would like Adah to keep within her. That beauty is but skin deep and when she eventually grows up into a young lady, she will not fall prey to worldly ideals of beauty and learn to develop her own very attractive character. A side picture of the LO. Am so totally in love over that red... and those fluffy flowers, gotta get more of them, love their textures! I can just drown in a bed of Prima goodness! Lols!!! I created this Printer's Tray for my baby niece, Danielle as a gift for her full- month celebration. She has such big round eyes and a nice curious smile, if she's not yelling to be carried. She is definitely doted upon by many. Adah and Asher are the only grandchildren on my brother's side of the family before Danielle's arrival and these two monsters have already outgrown their cutesy stages long ago. And Danielle is the first grandchild on my sis-in- law's side of the family, so there was much excitement and amusement over this tiny thing when she arrived. I am proud of those photos on the tray. I took them when Danielle was 5 days old, nervously. It's my second time practising on a newborn, but this time I had more props, photoshop and an idea of what I wanted to shoot and surprisingly, my grouchy brother was game to try out the angles. That's his hand holding out Danielle in the middle of the tray. Lots of layering there on the rest of cubicles on the tray which are not filled with photos. My usual, sweet, girly touches. After all, Danielle is a little girl. Love the bright felt butterfly which I had stashed up for a long time from Basic Grey long time ago. It's finally put to use. 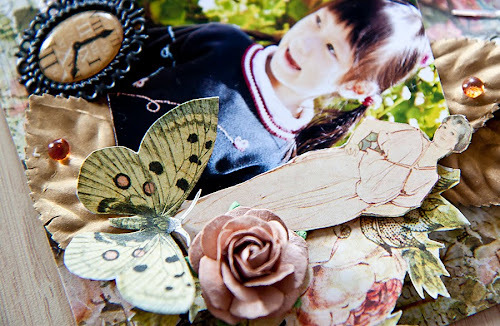 I used Websters Pages for most of the background papers, stuck on with glitter Mod Podge and embellished mainly with my leftover chipboards from Crate Paper's Restoration line. I added an envelope from G45so that my sis-in-law can write down her birth details and keep it there. I am sure those memories would stay with her for a long time. School holidays for Adah start this Friday. I am so looking forward to it and having the two kids spend more time with each other. Hopefully I get more scrapping time in between and I have 2 photoshoots requested from my girlfriends of their kids. I am looking forward to having some more nice pictures to share and scrap! By the way, Swee Ching mentioned that most of the slots for my 'Fly Butterflies Fly' class at Made With Love have been taken up. Thank you so so much everybody for your support, and I hope I will not disappoint and that I will get enough time to interact with everyone and know you all better. There will be lots of cutting, so I hope we can complete the class on time! ;-P For those who have not been able to get a slot, you can always put your name on the reservation list and if we have any spare kits at class!